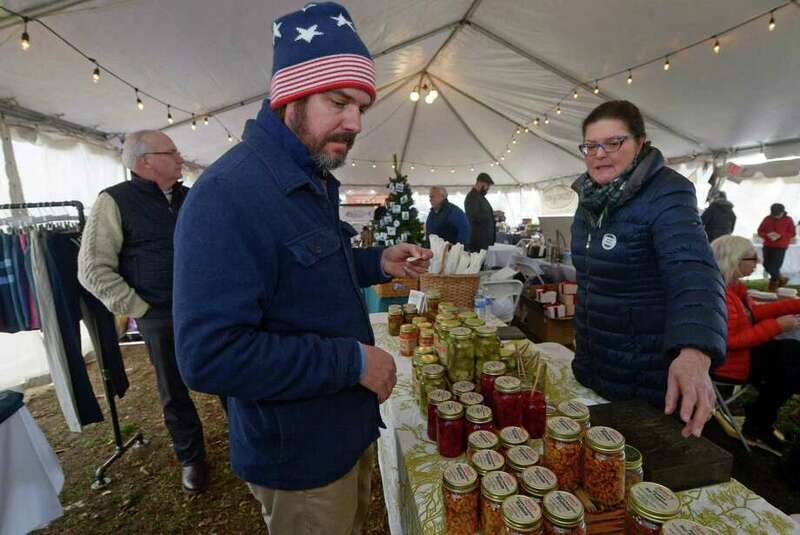 Norwalk resident Gardner Gray tastes the preserves from Jane's Good Food owner Jane Costello of Westport during the Rowayton Historical Society Holiday Bazaar Saturday, Nov. 24, at Pinkney Park in Norwalk, Conn. The Bazaar which hosts one-of-a-kind products continues Sunday from noon to 7 p.m.
Bob Rose, a longtime Westport resident, and Stepping Stone Farm’s Rocky decisively won the 2018 championship ribbon in the Low Training Jumper division of the Fairfield Westchester Professional Horsemen’s Association. Rose rode all year to top ribbons at horse shows, to win this coveted award. Rose also won the 2018 Reserve Championship ribbon in the Child/Adult Jumpers division. Bob took a 35-year hiatus from horse show competition in order to raise a family only to return to his lifelong passion. He is a member of Stepping Stone Farm’s/Starbuck Equestrian’s show team. His trainers throughout the year were Amanda and Juliana Starbuck, Janie Starbuck Weber, Kathy Fogg, and Emma Ryan. Westport families, gyms and fitness studios hosted 17 wounded, post-9/11 combat veterans for a weekend of fitness workouts, camaraderie and a fundraiser over Veterans Day weekend. These veterans were chosen by the national nonprofit organization, Catch a Lift Fund, which is dedicated to providing in-home fitness equipment and gym memberships for post-9/11 wounded veterans in order to regain their physical and mental strength. CAL’s wide network of nearly 3,000 veterans are reaping the benefits of daily health regimens and repurposing themselves into their communities through fitness. Seventeen veterans from around the country participated in the Westport for Warriors Weekend, which included several workouts and seminars, including a boxing/boot camp class at JoyX in Westport, a CrossFit workout at Revelution Fitness/OPEX in Norwalk, a workshop with the National Personal Training Institute’s Jillian Scheuler and nutritionist Katie Diehl, an indoor cycling class at JoyRide Cycling Studio in Westport, recovery workouts with Andrew Kindt at Achieve Fitness in Norwalk, a workout at The Edge with CAL alum-turned-personal trainer James Hazelip, and a boot camp-style workout led by officer Brendan Fearon at the Westport Police Department. In 2017, CAL raised $1.4 million and audited at 90 percent of all funds going to the veterans program. Owner Patricia Gabel founded Stardust Move Managers LLC in 2014 for the purpose of assisting seniors with downsizing and relocation. She has been in the Senior Move Management business since 2005. The company’s mission is to serve seniors and their families as they navigate the difficult and emotional process of moving. They provide professional expertise and support for transitioning to a new residence, whether that be independent living, assisted living, skilled nursing care or estate dispersal. The Department of Human Services’ annual Holiday Giving Program benefitting Westport residents is underway. Following established guidelines for Westport’s Warm-Up Fund eligibility, the Human Services Department serves largely as a facilitator, allowing Westport residents who wish to give to do so, while protecting the confidentiality of both the donor and receiver. Some of the most appreciated gifts are grocery and gas gift cards of any amount, as well as gift cards to local stores where residents may shop. In addition, cash donations are always welcome as they allow for the purchase of last minute gift cards for clients. Checks may be made payable to “DHS Family Programs” with “Holiday” on the memo line and may be mailed or dropped off in Room 200 at Town Hall (110 Myrtle Avenue). This year, donations may be accepted through the “WeCareWestport” portal at www.westportct.gov/index.aspx?page=1183, choosing “Family to Family” on the drop down menu. Those donors wishing to “shop” for a family’s actual gift requests, can also be accommodated at whatever level the donor feels comfortable. Westport residents and organizations who wish to donate to this effort are urged to contact Patty Haberstroh at hsyouth@westportct.gov or 341-1069 as soon as possible. In addition, families who feel they will need extra support during the coming holiday season should also contact the department at 203-341-1050.